TBILISI, DFWatch–Georgia’s National Bank noted a one percent increase in money transfers into the country in August 2014, compared to the same period last year. The amount of money transferred from abroad in August was 225.1 million lari (130.1 million USD); 0.9 percent more than in August 2013. 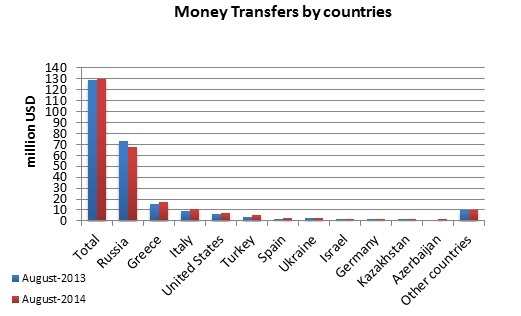 Among the eleven countries from which most money originated, there was a drop in the percentage of transfers from former Soviet countries Russia (from 56.5 to 52.0 percent) and Ukraine (from 2.4 to 1.8 percent), while western countries increased their share: Greece (12.3 to 13.1 percent), Italy (7.4 to 8.3 percent) and United States (4.9 to 5.5 percent). While the money transferred into Georgia grew slightly, the amount of money transferred out of the country in August increased significantly by 11 percent to 25.2 million lari (14.6 million USD).